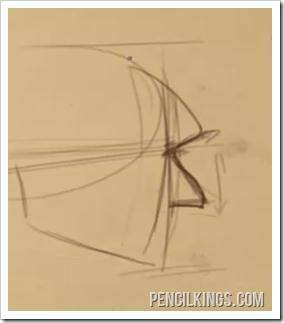 In this lesson on drawing a nose, you will learn how to place the nose on the face. There are all kinds of different formulas that have been devised over the years for placing the nose in relation to the other parts of the face, but for the purposes of this foundation lesson you will be using a simplified formula that is easy to understand while still giving you great results. 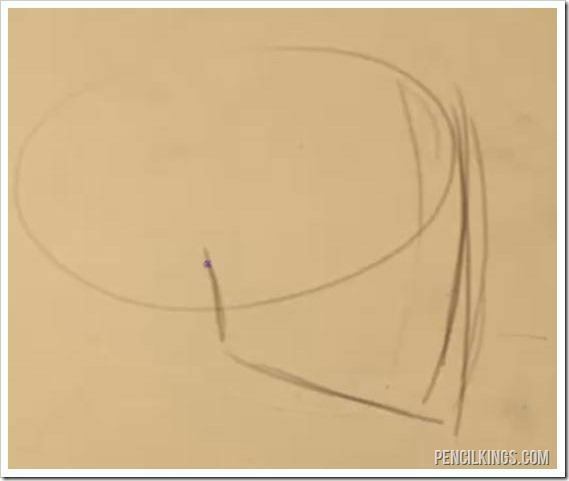 First draw an oval to create the basic shape for the head. Because you’re only worried about the placement of the nose here, don’t worry about detailing the overall shape of the head beyond anything other than an oval. Then divide the head in half at the horizontal middle point. Lastly divide the head one more time between the horizontal middle (the eye line) and the bottom of the oval (the chin). The distance between this newly created line and your eye line is where you will place the nose. 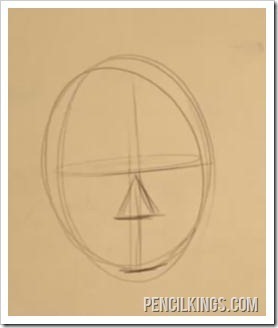 Again, start with a simplified shape of the head by first drawing an oval for the spherical part of the skull, and then drawing a line coming down from the front of the face to the bottom of the chin. Finish drawing the head by adding two more lines to create the jaw where it attaches to the skull. 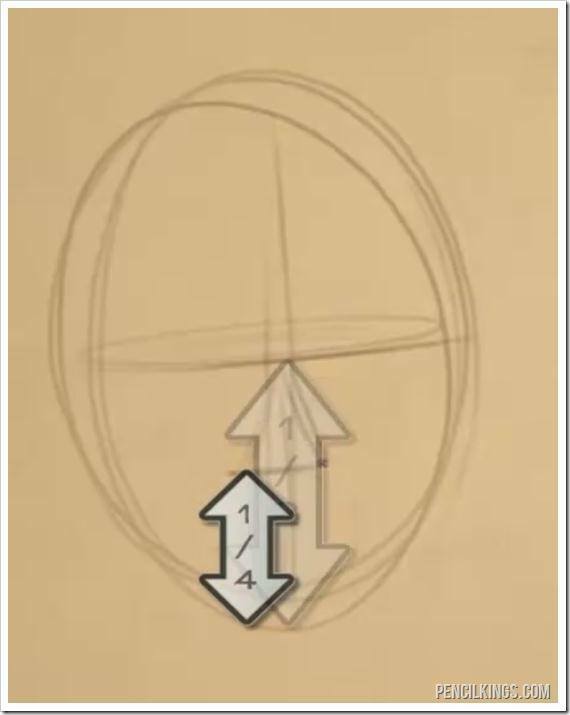 Once again you can divide the skull in half with the eye line, and then divide it in half again to get the height of the nose. Now that you have measured out and placed the nose on the face you can begin to experiment with adjusting how the nose attaches to the face at the eye line and then drawing different brow lines to dramatically change the feeling of the character that you are drawing. In this example you can see that the brow has been pushed out, and in the video you can see what happens when the brow gets pushed in and how that effects the look of the character. 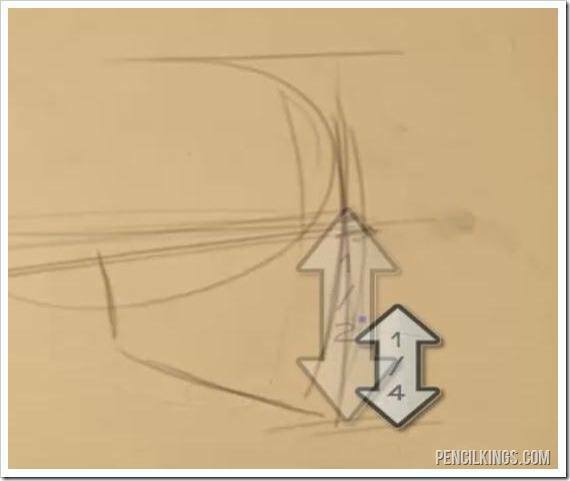 In the next lesson on drawing a nose, you will be looking at the male and female noses and what things you need to keep in mind while you are drawing them.